A wide variety of horses can be seen every day throughout the fair, and it’s your opportunity to learn about these majestic creatures up-close. Find horses daily in the Horse Barn, but be aware of early closing times on certain days! Thursday, Aug. 22: 8 a.m. to 9 p.m.
Tuesday, Aug. 27: 8 a.m. to 9 p.m. Note: Fewer horses will be in the barn this day due to horse arrival and departure. Wednesday, Aug. 28: 8 a.m. to 9 p.m.
Thursday, Aug. 29: 8 a.m. to 9 p.m.
Friday, Aug. 30: 8 a.m. to 9 p.m.
Saturday, Aug. 31: 8 a.m. to 9 p.m.
Sunday, Sept. 1: 8 a.m. to 9 p.m.
Monday, Sept. 2: 8 a.m. to 5 p.m. Note early closing time for livestock departure. * To ensure the safety of fair guests, horses and exhibitors, the Horse Barn will close on select days during competition preparation but may reopen after competition concludes. To see the majestic draft horses, venture across the street to the Warner Coliseum. 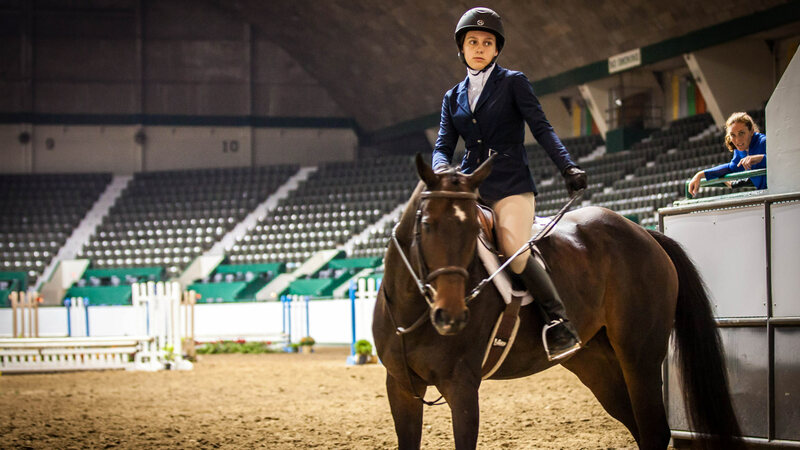 The Lee & Rose Warner Coliseum features many horse shows during the fair, including cutting horse competitions, driving classes, speed events, drill and square dance teams, draft horses and much more. Learn more about horses through educational programs like Aisle of Breeds and EquiMania!™ in the Horse Barn. Be sure to check out the daily schedule for exact hours of where and when to find horses during the fair, including judging and shows. Daily schedules can also be picked up from any information booth during the fair.